White chocolate and cranberry is a common pairing for the holidays. 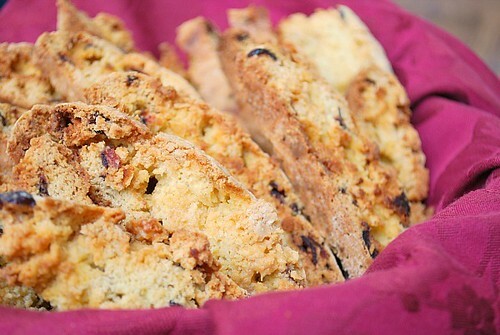 In this recipe they just add to the already sweet biscotti base and enhances it more. 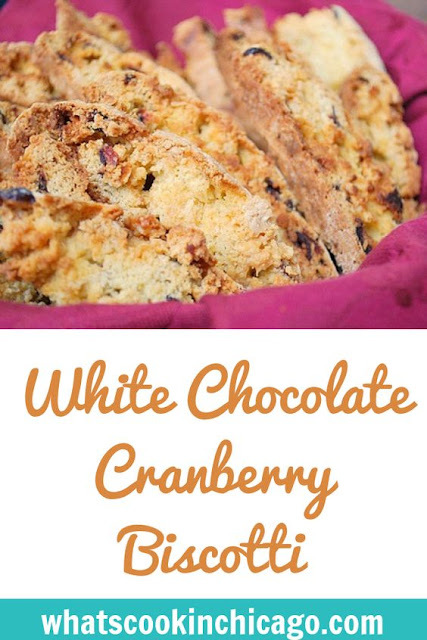 Feel free to add more or less of the white chocolate and cranberry to your tastes. This is such a versatile recipe that you can even add addition ingredients such as nuts. In a bowl of your stand mixer (or with a hand mixer) combine the flour, sugar, baking powder and salt. Beat until blended (about 30 seconds). Gradually add the egg mixture and beat until a dough forms, adding the dried cranberries and white chocolate about halfway through. With floured hands divide dough in half. On a lightly floured surface roll dough into a log about 10 inches long and 3 inches wide. Transfer log to the prepared baking sheet and bake for 35-40 minutes, or until firm to the touch. Note - logs will spread during baking. Remove from oven and let cool on a wire rack for about 10 minutes.